Breakfast is such an important meal and opportunity to fuel the body. As the name suggests, this is the meal that literally breaks the fast. While there isn't one perfect breakfast option, there are definitely nutrients to look to include like whole grains, fruit, healthy fats, and protein. This mix of nutrients will help to fuel and refuel the body. Overnight oats are such a great option because you make them ahead of time and then let the oats sit overnight. You can then warm them up before you eat them or just enjoy them right out of the refrigerator. Oats not only deliver fiber to help fill you up, they also deliver protein, one cup of oats has about 10 grams of protein. In comparison - one large egg has about 6 grams of protein. The oats then serve as a perfect foundation for nutrient-rich toppings and additions like fruit, nuts, chia seeds, hemp seeds, and more! There are almost endless options for overnight oats so experiment and find the mixture that is best for you - even try savory options with toppings like avocado, egg, and chopped scallions. 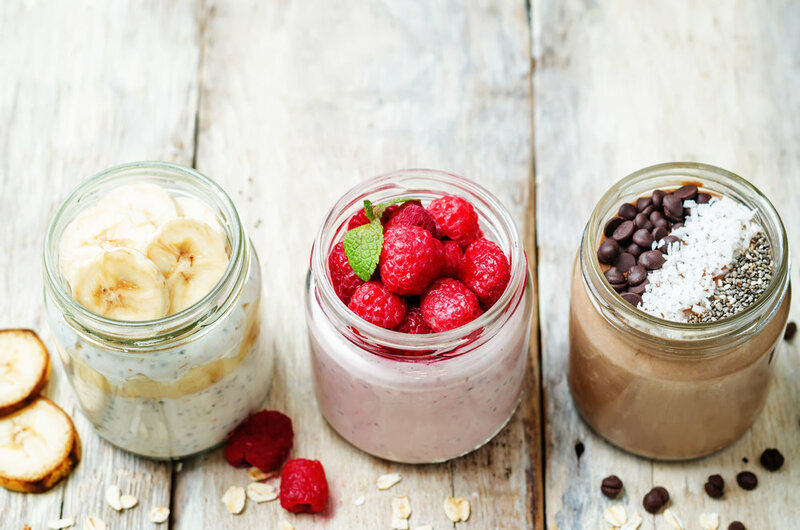 Below are three overnight oats recipes for you to try! 1. Mix the oats, almond milk, and chia seeds together in a small mixing bowl. 2. In a pint-size jar, start with 1/3 of the oatmeal mixture. Then layer frozen raspberries. Top with 1/3 of the oatmeal mixture. Then layer with frozen blueberries. Top with 1/3 of the oatmeal mixture. Finish with a layer of frozen strawberries. 3. Cover and refrigerate overnight. Optional: To serve finish with 1 - 2 teaspoons maple syrup or agave nectar. Topping suggestion: Top with fresh bananas, fresh raspberries, and/or coconut chips. 1. Combine the spices and agave nectar to the milk, whisk together. Then add the spice-milk mixture to the oats. Shake or stir to combine. 2. Transfer to a pint size jar or container, cover and refrigerate overnight. Serving suggestions: Top with raisins, sliced pear, coconut flakes, and/or hemp seeds. 1. Combine the cinnamon, maple syrup, and the milk, whisk together. Then add the spice-milk mixture to the oats. Shake or stir to combine. Serving suggestions: Top with chopped apple slices, walnuts, chocolate chips, sliced banana, and/or pecans. Superfoods come in many different colors, sizes, and shapes! Q: What superfoods should athletes have? A: There isn’t any one ‘superfood’ that athletes should have, although there a wide variety of foods that deliver important nutrients that athletes should routinely work to include! Also keep in mind, there isn't a technical definition of 'superfood', I consider superfoods to be those foods that deliver important nutrients and/or properties like: vitamins, minerals, fiber, protein, etc. Lentils provide plant-based protein, soluble fiber, insoluble fiber folate, potassium, iron, and manganese. Each aspect of nutrition that lentils deliver is essential for athletes! Adequate protein is a must for rebuilding muscles, repairing muscles, maintaining strength, and overall muscle mass. While most people get plenty of protein from meats/animal sources, it is important to incorporate plant-based protein sources as well that deliver fiber, vitamins, minerals, and lentils deliver all-that! Each cup of cooked lentils has about 18 grams of protein, which is equivalent to the protein content of about 3 large eggs. Try this Chia Cherry Lentil Muffin recipe (pictured above)! Click here for the recipe. Quiona delivers fiber, protein, and important vitamins and minerals including: magnesium, phosphorus, manganese, zinc, iron, thiamine and folate. For athletes, magnesium is especially important because it is a key player in energy production and metabolism. Make a stir-fry and serve it with quinoa instead of brown rice. Almonds delivers unsaturated fat and vitamin E, in fact one ounce (a small handful) of almonds delivers 34% of the daily value for this important vitamin. For athletes, vitamin E is important as it is an antioxidant that can help to keep cells healthy. Add-in almonds to trail mix, enjoy a handful of almonds, or add sliced almonds to cereal! Walnuts deliver unsaturated fat and omega-3 fats (a type of polyunsaturated fat); one once (a small handful of walnuts delivers 0.76 grams of omega-3 fats. This is important for athletes because omega-3 fats are linked to decreased inflammation in the body. Add-in walnuts to trail mix or to quick breads (e.g. banana bread)! Broccoli delivers vitamin C, an important vitamin for the immune system! Each serving of broccoli delivers 220% of the daily value for vitamin C, plus about 4 grams of fiber. Vitamin C can help to keep athletes immune system healthy throughout the year! Try chopped broccoli with your favorite dip for a snack or add roasted broccoli as a side dish at dinner! These garlic quinoa poppers are a great quick snack or addition to a meal. What is awesome about them from a nutrition perspective for athletes is that they are made with a base of nutrient-rich quinoa (pictured below). Quinoa cooks up just like rice but delivers twice the protein compared to rice. Plus quinoa is gluten-free, as it is technically a seed, although is often considered a whole grain. Each serving of this recipe (2 poppers) has 6 grams of protein! 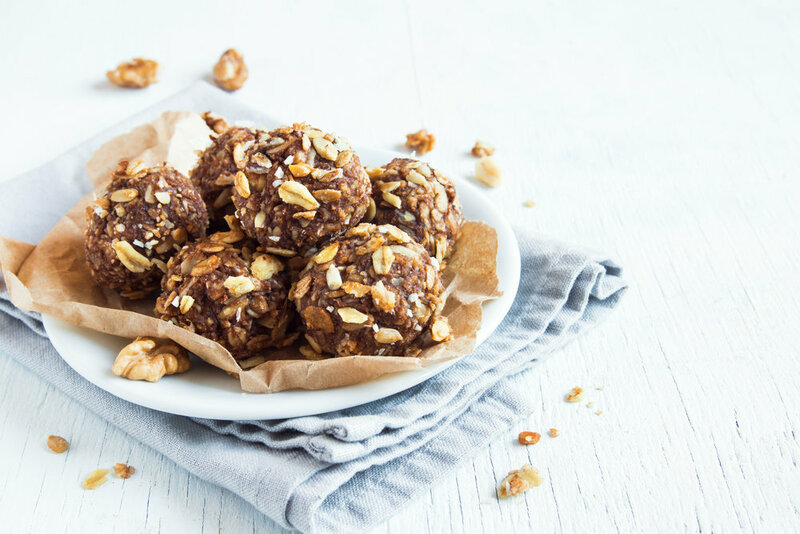 Make a batch of these poppers up to have on hand for snacking, a great way to keep your energy up between meals! Click here to download the snacking handout for more ideas. 1. Combine the quinoa and water in a small pan. Bring to a boil, lower heat and simmer for 15 - 20 minutes. 2. Preheat oven to 350º F. Prepare a mini muffin pan with non-stick cooking spray. 3. In a mixing bowl, lightly beat the eggs. Then mix in cooked quinoa and chopped onion. 4. Add cheese, garlic, onion powder, garlic powder, and cream cheese. Mix until well combined. 5. Transfer mixture to the prepared mini muffin tin (about 1 tablespoon of mixture per muffin). 6. Bake for 20-25 minutes or until golden brown and cooked through. This bar recipe is quick and easy to make. Plus they are perfectly delicious and they deliver whole grains, healthy fats, and fiber for longer lasting energy! 1. In a mixing bowl combine the oats, quinoa puffs, pistachios, dates, and sea salt. Stir to combine. 2. On the stove-top in a small sauce pan combine the peanut butter and honey and stir over medium heat until the mixture is combined and melted. 3. Stir the peanut butter honey sauce into the oats/nuts mixture. Then stir in the chocolate chips. 4. Prepare a 9" x 13" pan with non-stick cooking spray. Press the mixture into the pan and spread evenly. Then refrigerate for at least 1 hour to firm up the bars and then slice!